Months which begin at each new moon. a Hebrew Month and Gregorian year. Who has believed Our report? And to whom has the arm of יהוה been revealed? For He comes up as a tender plant before Him, and as a Root out of a dry ground. He has no form, nor honor, when we observe Him, nor beauty, that we should desire Him. He was despised, and rejected by men, a man of sorrows, and acquainted with grief. And as one hiding His countenance from us, He was despised, and we did not esteem Him. Surely He has borne our griefs, and carried our sorrows, yet we esteemed Him stricken, smitten by Elohim, and afflicted. And He was pierced for our transgressions, bruised for our iniquities, the punishment that brought us peace was upon Him, and by His stripes we are healed. All we like sheep have gone astray, we have turned each to his own way, and יהוה has laid on Him את the punishment of us all. He was oppressed and He was afflicted, yet He did not open His mouth. He was led as a Lamb to the slaughter, and as a sheep before its shearers is silent, He did not open His mouth. By oppression and trial was taken away, and who can speak of את His descendants? For He was cut off from the land of the living, for the transgressions of My people He was stricken. And He made His grave with את the wicked, and with את the rich in His death, because He had done no violence, nor was any deceit in His mouth. Yet it pleased יהוה to bruise Him and to cause Him to suffer, and though יהוה makes His life an offering for sin, He will see His offspring and prolong His days, and the will of יהוה will prosper in His hand. He shall see the labor of His soul, and be satisfied. By His knowledge My righteous Servant shall justify many, for He shall bear their iniquities. Therefore I will give Him a portion with the great, and shall divide את the spoil with the strong, because He poured out His soul even to death, and was numbered with את the transgressors, and He bore the sin of many, and made intercession for the transgressors. The Spiritual Year begins at the moment of sunset at Jerusalem, on the evening of the first potentially visible crescent moon beginning Day 1 of Month 1. A Spiritual Year can begin before or after the spring equinox. The rule of the equinox always places Day 15 of Month 1 on or after the Hebrew Day of the spring equinox. A Hebrew Year always contains 12 Hebrew Months in a regular year or 13 Hebrew Months in a leap year. The Spiritual Year begins on Day 1 of Month 1 based on the rule of the equinox and the typical Civil Year begins on Day 1 of Month 7. Once every 50 years the special Jubilee Year begins on Day 10 of Month 7. Day 1, Month 1, 2019 C.E. Day 1, Month 2, 2019 C.E. Day 1, Month 3, 2019 C.E. In Exodus 12:2, יהוה instructed Moses and Aaron to reckon the month of the Exodus as "the head of the months" and it is to be the "head of the year". The Exodus occurred in Hebrew Month 1. As יהוה wanted Israel to be a spiritual nation walking in the light of truth, He instructed Moses and Aaron to reckon the Spiritual Year from the spring - from Month 1 - as this was also the month in which the universe was created. יהוה is in the process of building a spiritual nation - a nation that will be led by the Spirit of Elohim - the Spirit of יהוה - the Spirit of יהושע the Messiah. Revelation 19:10 says, "Worship Elohim! For the testimony of יהושע is the Spirit of prophecy." It is time for the spiritual nation of Israel to come to grips with the way יהוה reckons time. For only in doing so, will Israel understand her past, and in turn fulfill her destiny. The moon travels around the earth once every lunar cycle. From a heliocentric perspective, the earth travels around the sun once every solar cycle. The diagram above shows the position of the moon and the earth, in relation to the sun, for any date. Equinoxes and solstices are designated by long lines dividing the year into its four seasons. Arrows on the gray circles show the direction of travel for the motions of the moon and earth. The dots mark the daily positions of the moon throughout the month. Three months are shown, one on either side of the Hebrew Month indicated. This graphic illustrates how the Creation Calendar uses both the sun and the moon to calculate days, months and years. 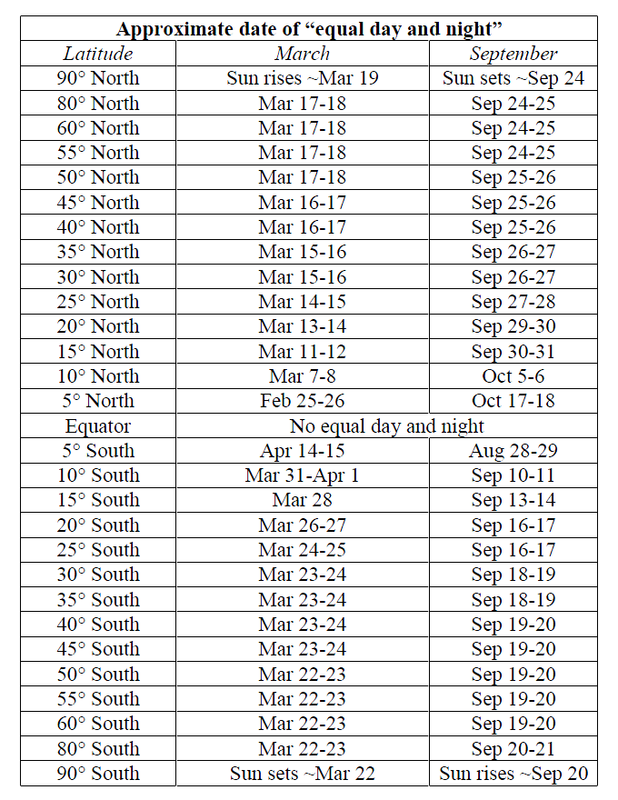 More specifically, it is helpful for visualizing how the rule of the equinox is used to intercalate a leap month. The spring equinox is represented by a red line in this diagram. The rule of the equinox states that if by Day 15 of the Hebrew Month following Month 12, the center of the earth is on or has already crossed the red line of the spring equinox, then the month following Month 12 is Month 1. If by Day 15 of the Hebrew Month following Month 12 the earth has not yet crossed the red line, then the month following Month 12 is Month 13. The rule of the equinox is a perfect judgment of Elohim for determining the Hebrew Year. Deuteronomy 32:3-4 For I proclaim the name of יהוה : Ascribe greatness to our Elohim. He is the Rock, His work is perfect, for all His ways are judgment, an Elohim of truth and without iniquity, righteous and upright is He. This diagram is a simplified representation of the motions of the earth and the moon. Although depicted as circles, the orbits of the earth and moon actually have an elliptical shape which looks more like an oval. Likewise, the speed of travel at points along these orbits varies throughout the year. For example, the earth travels slightly faster when it is closer to the sun than when it is further away. For this diagram, the orbits are shown as circles since visually, their elliptical aspect is minimal. However, the relative positions of the earth and moon as time progresses are rendered correctly. Therefore, in this diagram, the passage of the earth across the equinox and solstice lines will always occur on the correct dates. The daily positions of the moon, shown as dots on this diagram, appear to form a spiral pattern suggesting that the moon occasionally overlaps its path. However, this does not occur in the physical solar system. The spiral pattern results because the objects and relative distances shown in this diagram are not drawn to scale. For example, the average distance between the earth and sun is nearly 400 times the distance between the earth and the moon. Although this graphic is not drawn to scale, it correctly represents the orientations of the earth and the moon with respect to time. An equinox occurs twice a year, when the tilt of the earth's axis is inclined neither away from nor towards the sun, the sun being vertically above a point on the equator. The term equinox can also be used in a broader sense, meaning the date when such a passage happens. The name equinox is derived from the Latin aequus (equal) and nox (night), because around the equinox, the night and day are approximately equal in length. Contrary to its etymology, the term equinox is not the time or the day when day and night are of equal duration. People have been led to believe by standard dictionary definitions that the term equinox refers to the two times each year when the sun crosses the equator and day and night are of equal length all over the world. Although the first part of the definition is correct, the second part is not correct. The term equinox is often incorrectly equated with the term equilux which is discussed below. An equinox is defined as the time when the apparent geocentric longitude of the sun (that is, calculated by including the effects of aberration and nutation) is either 0 degrees (the spring equinox) or 180 degrees (the fall equinox). At an equinox, the sun is at one of two opposite points on the celestial sphere where the celestial equator (i.e. declination 0) and ecliptic intersect. These points of intersection are called equinoctial points: the vernal point and the autumnal point. By extension, the term equinox may denote an equinoctial point. An equinox happens each year at two specific moments in time (rather than two whole days), when there is a location on the earth's equator where the center of the sun can be observed to be vertically overhead, occurring around March 20 and September 22 on the Gregorian Calendar. The date at which the time between sunset and sunrise crosses 12 hours is known as the equilux. Because sunset and sunrise times vary with an observer's geographic location (longitude and latitude), the equilux likewise depends on location and does not exist for locations sufficiently close to the equator. The equinox, however, is a precise moment in time which is common to all observers on earth. The Creation Calendar does not use the equilux to determine the seasons as it is not a precise moment in time - it uses the equinox. On the day of an equinox, the center of the sun spends a roughly equal amount of time above and below the horizon at every location on the earth, night and day being of roughly the same length. Although the word equinox derives from the Latin words aequus (equal) and nox (night); in reality, the day is longer than the night at an equinox. A day is commonly defined as the period when sunlight reaches the ground in the absence of local obstacles. From the earth, the sun appears as a disc rather than a single point of light, so when the center of the sun is below the horizon, its upper edge is visible. Furthermore, the atmosphere refracts light, so even when the upper limb of the sun is below the horizon, its rays reach over the horizon to the ground. In sunrise / sunset tables, the assumed semidiameter (apparent radius) of the sun is 16 minutes of arc and the atmospheric refraction is assumed to be 34 minutes of arc. Their combination means that when the upper limb of sun is on the visible horizon, its center is 50 minutes of arc below the geometric horizon, which is the intersection with the celestial sphere of a horizontal plane through the eye of the observer. These cumulative effects make the day about 14 minutes longer than the night at the equator and longer still towards the Poles. The real equality of day and night only happens in places far enough from the equator to have a seasonal difference in day length of at least 7 minutes, actually occurring a few days towards the winter side of each equinox. This chart appears on page 39 of a document entitled "Ancient Observatories - Timeless Knowledge" which was compiled in 2015 by Deborah Scherrer for the Standford Solar Center. Permission for use was given for educational, non-commercial purposes. A solstice is an astronomical event that happens twice each year, when the tilt of the earth's axis is most inclined toward or away from the sun, causing the sun's apparent position in the sky to reach its northernmost or southernmost extreme. The name is derived from the Latin sol (sun) and sistere (to stand still), because at the solstices, the sun stands still in declination; that is, the apparent movement of the sun's path north or south comes to a stop before reversing direction. The term solstice can also be used in a broader sense, as the date (day) when this occurs. The summer solstice occurs around June 21 and the winter solstice around December 21 on the Gregorian Calendar. The average duration of an astronomical solar year is approximately 365.2422857 days based upon calculations of earth's orbit around the sun over a 7000 year period. A precise solar calendar would be one synchronized to the astronomical solar year where the calendar days on which the equinoxes and solstices occur from year to year are not allowed to drift over time. Julius Caesar, intending to create such a calendar, introduced the Roman Julian Calendar in 46 B.C.E. The Julian year had 365 days where every fourth year added a leap day resulting in an average year length of 365.25 days per year. The Julian Calendar, which was used until October 4, 1582 C.E., was eventually replaced by the more precise Gregorian Calendar. The newer Gregorian Calendar with its average year length of 365.2425 days, better approximates the astronomical solar year, thereby further reducing equinox and solstice drift over time. The Gregorian Calendar also corrected a 10 day drift of the equinoxes and solstices that had gradually resulted from using the less accurate Julian Calendar. The proleptic Julian Calendar is a theoretical retro-calculated calendar. It uniformly extends the Julian Calendar from 1582 C.E. backwards in time until the creation of the universe. However, as it is less accurate in approximating the astronomical solar year, significant drift can be seen in the timing of the equinoxes and solstices over thousands of years. The accumulated error in the proleptic Julian Calendar is approximately seven days per 1000 years. Going back in time 4000 years from 1582 C.E., the equinoxes and solstices appear to drift forward about a whole month. A Hebrew Day begins and ends at the time of local sunset. However, a Hebrew Month is determined by first potential crescent visibility at Jerusalem in accordance with Psalm 137:5. On the Creation Calendar, the Hebrew Day of an equinox or solstice is displayed with a yellow rectangle to indicate this event. Sometimes the moment of an equinox or a solstice occurs after sunset at Jerusalem but before midnight Universal Time. If this occurs, a yellow triangle is shown on the Hebrew Day in question to show this anomoly, and a yellow rectangle appears on the Hebrew Day in which the moment of the equinox or solstice occurs. A yellow rectangle at the bottom of a day indicates an equinox or solstice event occurs during that day. The precise time of the event is displayed inside this yellow rectangle area. If an equinox or solstice event occurs after sunset in Jerusalem on the Gregorian/Julian date listed in almanacs, then a yellow triangle appears for that day. A yellow rectangle indicates the equinox or solstice event on the correct Hebrew Day. The solstices together with the equinoxes are the demarcation points dividing the seasons in the Creation Calendar. The Hebrew Scriptures use the word תקופת tekufot to describe the two ends of heaven in the sun's circuit as viewed from earth — the spring and fall equinoxes. The spring tekufot is used as the orientation point to determine the entire Hebrew Year. The word tekufot appears in various forms four times in Scripture. Exodus 34:22 And you shall observe the Feast of Weeks, of the firstfruits of wheat harvest, and the Feast of Ingathering at the תקופת turn of the year . 1 Samuel 1:20 So לתקפות in the course of time Hannah conceived and gave birth to a son. She named him Samuel, saying, "Because I asked יהוה for him." 2 Chronicles 24:23 Now it happened at the לתקופת turn of the year that the army of the Arameans came up against him [Joash]; and they came to Judah and Jerusalem, destroyed all the officials of the people from among the people, and sent all their spoil to the king of Damascus. Psalms 19:4-6 In them He has set a tabernacle for the sun, which is as a Bridegroom coming out of His chamber, as a champian rejoices to run a race. It rises at one end of heaven ותקופתו and makes its circuit to the other end, and there is nothing hidden from its heat. According to Exodus 34:22, the tekufot occurs in the season of fall during the Feast of Ingathering. The reference in 2 Chronicles 24:23 is probably to the season of spring when many battles were fought in the ancient world. The passage in Psalms 19:4-6 indicates the tekufot is based on the cycle of the sun. The account in 1 Samuel 1:20 links the word tekufot לתקפות with the birth of Samuel which apparently was in the season of fall. The word tekufot is translated in this verse as in the course of time. The traditional date for Samuel's birth is Day 1 of Month 7 on Yom Teruah as Rosh Hashanah 11A says Hannah was visited on this day. Ta'anis 5B says Samuel lived 52 years, but in 1 Samuel 12:1-2, Samuel in his farewell address said he was old and gray headed. Based on 1 Samuel 1:20, Samuel was likely born on Yom Teruah on the fall equinox on Day 1 of Month 7 in 1074 B.C.E. Megillas Ta'anit says that Samuel died on Day 28 of Month 2 which was likely on Day 28 of Month 2 in 1002 B.C.E. According to this understanding Samuel would have been 71 years old when he died. Elohim created the sun to rule the day and the moon to rule the night, to separate the day from the night and to divide light from darkness. The results of this creative act are seen every day and every night. The sun and the moon were created for signs which are occasionally visible in solar and lunar eclipses. They were also created for appointed times. This point is not understood by many who follow calendars not concerned with the movements of the sun and moon. The sun and the moon were also created for calculating days and for calculating years. Genesis 1:14-19 Then Elohim said, "Let there be lights in the firmament of the heavens to divide the day from the night; and let them be for signs and appointed times, and for days and years; and let them be for lights in the firmament of the heavens to give light on the earth," and it was so. Then Elohim made two great lights: the greater light to rule the day, and the lesser light to rule the night. He made the stars also. Elohim set them in the firmament of the heavens to give light on the earth, and to rule over the day and over the night, and to divide the light from the darkness. And Elohim saw that it was good. So the evening and the morning were the fourth day. יהוה Elohim requires that three times every year all males of Israel are to appear before Him in Jerusalem. Exodus 23:14-17 Three times a year you are to keep a festival to Me. You shall keep the Festival of Unleavened Bread: You shall eat unleavened bread seven days, as I commanded you, at the appointed time of the month of Aviv [Month 1], for in it you came out from Egypt, and none shall appear before Me empty, and the Festival of Harvest [Shavuot], the firstfruits of your labors which you have sown in the field, and the Festival of the Ingathering [Sukkot], which is in the end of the year when you have gathered in the labors out of the field. Three times in the year shall all your males appear before the Master יהוה. Deuteronomy 16:16 Three times in a year shall all your males appear before יהוה your Elohim in the place which He shall choose; in the Feast of Unleavened Bread, in the Feast of Weeks [Shavuot], and in the Feast of Tabernacles [Sukkot]: and they shall not appear before יהוה empty. All three festivals need to take place within a single year. The Creation Calendar keeps the agricultural festivals properly oriented to the solar cycle (tropical year) which today is believed to be 365 days, 5 hours 49 minutes 19 seconds in duration. The ancient Israelites, some of whom wrote the Scriptures containing specific dates from the Creation Calendar, were well aware of the need for the Hebrew Year to stay properly tethered to the solar cycle (tropical year). They adhered to the rule of the equinox to ensure that this happened. For this reason, the Creation Calendar is superior in an error tolerance analysis to any other calendar. It ensures that Unleavened Bread will always be kept in its season from year to year as Exodus 13:10 instructs. Exodus 13:10 You shall therefore keep this ordinance [the Festival of Unleavened Bread] in its season from year to year. Elohim created the sun and the moon for calculating years, and the equinoxes and solstices are His demarcation points in the solar cycle. In calculating a Hebrew Year, the spring equinox governs the start of a Hebrew Year according to Exodus 12:1-2. The spring equinox is the demarcation point governing the solar cycle. The first day of Unleavened Bread on Day 15 of Month 1 is the critical day for calculating a Hebrew Year. In the Creation Calendar, the first day of Unleavened Bread on Day 15 of Month 1 always occurs on or after the Hebrew Day of the spring equinox. The first day of Unleavened Bread never occurs before the spring equinox. This ensures that all three festivals take place within a single year as יהוה specified. This rule is called the rule of the equinox, and it always places Day 15 of Month 1 on or after the Hebrew Day of the spring equinox. If at the moment of sunset at the end of Month 12, on the evening of the first crescent moon at Jerusalem, there are 15 Hebrew Days or less until the spring equinox, then Month 1 is declared. If there are 16 Hebrew Days or more until the spring equinox, then Month 13 is declared. The spring equinox will always occur on or between Day 16 of Month 12 in a Spiritual Regular Year, and Day 15 of Month 1 in the year following. The spring equinox will always occur on or between Day 16 of Month 13 in a Spiritual Leap Year, and Day 15 of Month 1 in the year following. The spring equinox is defined as the time when the apparent geocentric longitude of the sun (that is, calculated by including the effects of aberration and nutation) is 0 degrees. The Creation Calendar only intercalates, or inserts an extra month, at the end of Month 12. The intercalary month is called Month 13. In the Creation Calendar, the reference point for sighting the new moon is the vicinity of the Temple Mount in Jerusalem. This is one reason that the location of the Temple Mount is so intrinsically important. Regarding the rule of the equinox, it should be mentioned that there are currently some who are teaching that a Hebrew Year is reckoned from the first new moon after the spring equinox. It can be proven from a set of historical records called the Elephantine Letters, that this is the way the ancient Persians reckoned their year between 458 - 351 B.C.E. However, יהוה clearly instructed Israel not to follow the way of the nations in Jeremiah 10:1-2. As the Persians followed the way of Zoroastrianism, it is easy to determine that this method of determining when a year begins is not the narrow way that leads to life spoken of by יהושע the Messiah in Matthew 7:13-14 and Luke 13:24-30. A Close Call in 2011 C.E. Sometimes, the spring equinox can occur on the first day of Unleavened Bread on Day 15 of Month 1. An example of such a borderline case is Month 1 of 2011 C.E. The Creation Calendar shows the spring equinox occurring on Day 15 of Month 1 on March 20 at 23:21 UT (Universal Time). The Sunset Calculator shows the sun sets at Jersualem at the end of Day 14 of Month 1 on March 20, 2011 C.E. at 15:50 UT. Adjusting for Israel's time zone adds two hours to UT putting sunset at 17:50 IST (Israel Standard Time) which is 5:50 PM IST. Since the spring equinox occurs well after sunset ending Day 14 of Month 1, it clearly occurs within Hebrew Day 15 of Month 1. For Day 15 of Month 1 in 2011 C.E., the Creator's Clock shows the earth centered on the red line designating the spring equinox. This diagram graphically depicts the rule of the equinox showing it is Month 1 instead of Month 13 of the previous year. The New Moon at Jerusalem at the Moment of Sunset verifies that the crescent moon can be seen at sunset on March 6, 2011 C.E. which begins Day 1 of Month 1 of the new Hebrew Year. By viewing the sunset diagram for the day before, one can easily verify that the moon would not be seen at sunset on March 5. So in the year 2011 C.E., how close is Month 1 from being Month 13 of the previous year? The Sunset Calculator shows the sun sets at Jersualem at the end of Day 15 of Month 1 on March 21, 2011 C.E. at 15:51 UT (5:51 PM IST). Therefore, the spring equinox occurs a mere 16 hours and 30 minutes before the time when the rule of the equinox would have declared the month to be Month 13. Deuteronomy 32:3-4 I will publish the name of יהוה: ascribe greatness to our Elohim. He is the Rock, His work is perfect: for all His ways are judgment: an Elohim of Truth and without iniquity, just and right is He. Elohim has clearly declared that the sun and the moon are to determine both days, years, and appointed times which occur at very specific times of the lunar month. So why do some people critically observe the developmental stage of barley at the end of Month 12 in attempting to determine when a Hebrew Year begins? Although many reasons will be given by those engaging in this practice, the ultimate truth is that they do not believe Elohim on this issue. Elohim said that the sun and and the moon were created to determine years. In the time of Noah's flood there was no barley to observe, however precise calendrical dates are given in Scripture. There was no barley for the 40 years the children of Israel were in the wilderness, however precise calendrical dates are given in Scripture. If there is a drought in the land of Israel there may be no barley, but the Hebrew Year will still begin. Declaring festivals in the name of the Creator in a way in which Elohim did not prescribe does not please Him. Aaron and Jeroboam both ordained festivals for Israel which they had devised in their own hearts and it was considered by יהוה as idolatry. Aaron's sin is now commemorated as a fast on Day 17 of Month 4. Jeroboam's sin is commemorated as a fast on Day 23 of Month 3. TorahCalendar.com Copyright © 2008, 2009, 2010, 2011, 2012, 2013, 2014, 2015, 2016, 2017, 2018, 2019 All rights reserved. Duplication prohibited. Contents protected by U.S. and international copyright Laws. TorahCalendar.com grants the right for individuals to quote or make copies of any of the original materials presented at TorahCalendar.com provided that such materials are not altered in any way, retain all unaltered Copyright notices and are never used or distributed for any form of pecuniary gain or profit.